Thanks to Jim Lancaster for the following information. It was in response to a question that appeared on the Manchester & Lancashire FHS Forum – I have edited it slightly. Catholic nuns (there are Anglican and other nuns of whom I know nothing) are awkward to find because they ‘disappear’. They took a name in religion and generally were not recorded. Priests, on the other hand, are usually recorded in the annual Catholic Directory, etc. 1800. This lists English nuns that entered convents in exile – in Europe. a brief outline of their life. charge for searching in this index at the moment. there is no planned date at the moment. This website gives details of genealogical events and activities that are taking place in the UK. It is a useful site as you can find out what is happening in the coming months – have a look, you may find a local event that interests you, or something that is worth travelling to. The Salford Diocesan Archives are delighted to announce the publication of the first volume of the History of St Bede’s College, Manchester. 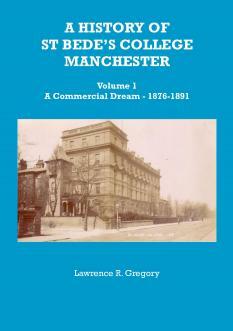 This first volume covers the period of the rise and fall of the Commercial Business School 1876-1891, with the first chapter detailing the background of Catholic Secondary Education in Manchester & Salford 1850-1876. The English Catholic History Association encourages interest in the Catholic history of England and Wales. They organise visits to places associated with the Catholic faith, and arrange conferences on subjects relating to our Catholic history. They also support research into subjects of Catholic interest and seek to prevent the destruction of Catholic archives. More details are on their website here. You will also find talks which have been recorded and can be downloaded and listened to. There’s an interesting article in this blog The hermeneutic of continuity about a campaign to buy Sawston Hall in East Anglia, one of the great recusant homes, and turn it into a Catholic heritage centre. You can read the details here and support the campaign if you wish.